Then in 1969, Art Rooney’s son Dan hired Chuck Noll from the Baltimore Colts to coach his team. Noll replaced undisciplined players with future hall of famers. By 1974 the team won its first world championship and went on to capture four Super Bowl titles in six years. Noll’s legacy for excellence continued with four more Super Bowl appearances and two championships in 2005 and 2008, garnering the franchise a league record of six Super Bowl wins. Classic Steelers includes these six championship tilts and takes citizens of the Steeler Nation on a play-by-play tour of the most memorable games in the team’s history. 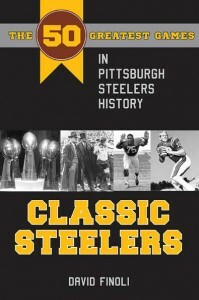 Author David Finoli recounts in vivid detail the thrilling gridiron performances that have made the Steelers so special to their legions of fans.